Such a neat line of products from Uncharted Play, Inc.. I’m very excited about this company and what they deliver to innovative, multipurpose design. 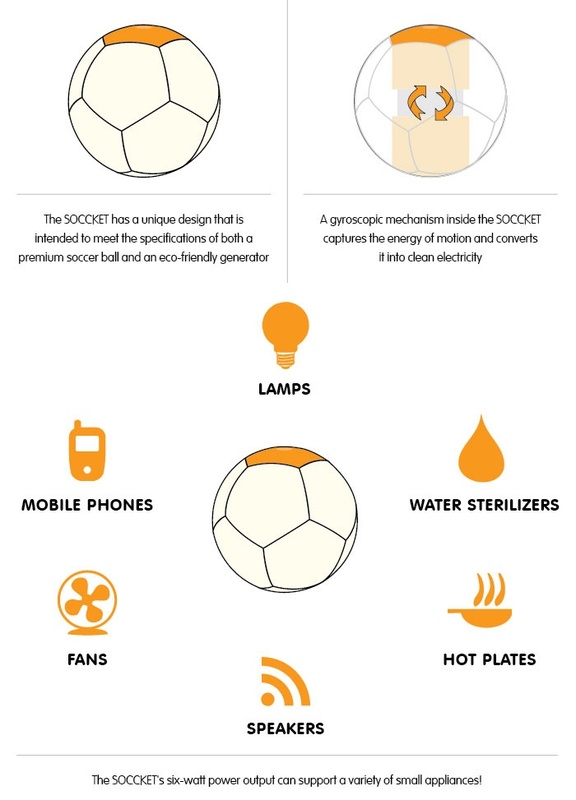 This feature of the SOCCKETT II, a rechargeable soccer ball really jumped out at me “About thirty minutes of play generates approximately three hours of power.” * I find this kind of dual role tool, practicality of charging/exercising and goal directive charging your phone/exercise, really fascinating. “Human beings are more similar than we think. Whether you’re born in New York or Namibia, everyone laughs. Everyone smiles. Everyone plays. …doing good doesn’t need to be boring. …anyone, anywhere can be a social inventor. I first found Uncharted Play, Inc. from an article on Refinery29.com, where founder is quoted about her work, the pressure of professional dreams. She’s an all around fascinating and impressive business woman! Please read this great article at The Vanguard describing the construction of SOCCKET II. Christensen, Clayton M. (2014): Disruptive Innovation. In: Soegaard, Mads and Dam, Rikke Friis (eds. ).